Why Petpal Is The Best Wi-Fi Automatic Feeder For Multiple Cats? 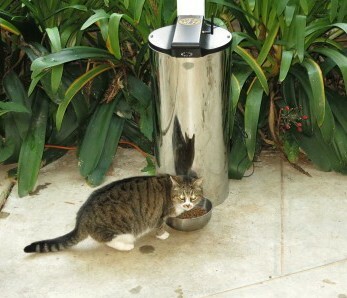 Is Petpal The Best Multi-cat WiFi Feeder? If you are a multi-cat owner I am sure you have endured the annoying reality of feeding your cats, which means having to pick up two or three food and water bowls more than once a day. Certainly, this is not a pleasurable task, especially if you suffer backaches. So after leaning over for years, you finally decide to get an automatic feeder to do the job for you. But which one would be the best option for your multi-cat needs? As you may know, I’ve investigated automatic feeders for a while and all of them have pros and cons. Considering this, I made my list of the best cat-proof automatic feeders that work great and some have the capacity of feeding 2 or even 3 cats, such as the Pet Feedster or the PetSafe. But what if I told you that there is one cat-proof durable automatic feeder with the capacity to feed multiple cats and that works with WiFi? Effectively, with Petpal Wi-Fi you can control your cats from anywhere through your Smartphone or Tablet, compatible with iOS and Android Applications. 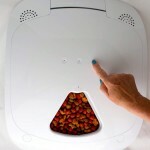 So if you are looking for a smart multi-cat feeder, the Petpal multi-cat WiFi automatic feeder is the best option. 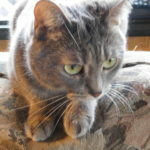 WHY IS PETPAL THE BEST MULTI-CAT WIFI FEEDER? 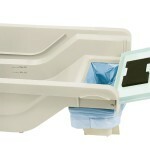 It’s made of stainless steel 9” x 11” tube and a stainless steel plate so the unit is designed to last. No plastic parts on this feeder which is a big deal nowadays. 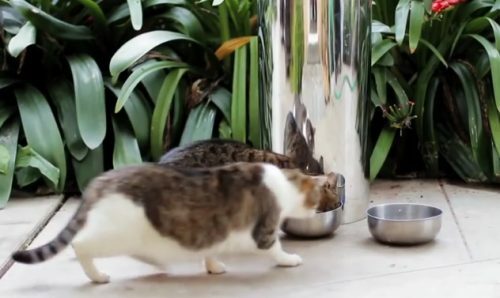 As the feeder is made from stainless steel, tipping the unit over won’t be an option if a “cat team” try to defeat the feeder. Plus, when the unit is filled with food the unit is even heavier and harder to move by mischievous paws. The feeder keeps the big amount of stored food sealed, this way the food doesn’t get spoiled. This is a big advantage if you want to fill the feeder to the top. Other automatic feeders have large food capacity but their lids are not airtight so people end up pouring only half of the hopper capacity to avoid the food from getting stale. The unit design is so simple so it’s easy to assemble, disassemble, refill and clean. As a multi-cat owner you need to do this more often so if Petpal is easy to re-assemble, refill and clean, even better. Also, the bowl is removable so you can place a wide food tray to feed 2 or 3 cats. Petpal minimum dispensing portion is ¼ cup of dry food, perfect if you want to feed several felines. This minimum portion could be a “con” for feeding a single cat, but is a “pro” when it comes to feeding several cats because you will need bigger meal sizes each time the feeder dispenses. 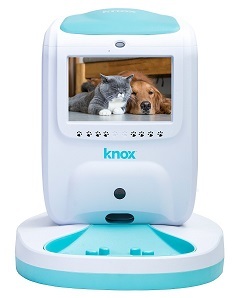 The unit has so many great features such as webcam to check on your cats, ability to talk to your pets and listen to your cats meowing because this unit works with bi-directional audio. You just need to choose either talk or listen to your cat. You can also record videos or take pictures of your feline friends. Reliability. Petpal best multi-cat WiFi feeder features a non-jamming system and this is crucial when feeding your several cats because if the unit jams it means your 2 or 3 cats will starve and you can’t afford taking that chance. Also, this automatic feeder works even if you lose the connection to internet. Peace of mind. 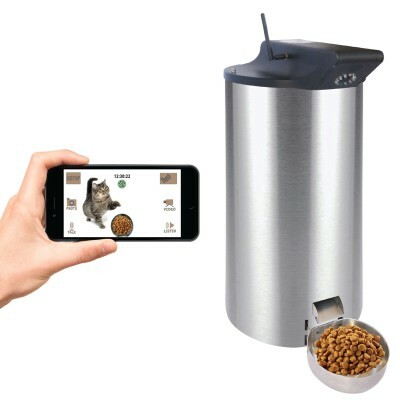 If you worry about your cats being fed you won’t anymore with this feeder because it allows you to record a video every time the feeder dispenses food and additionally you can trigger manual feedings from your Smartphone or Tablet. 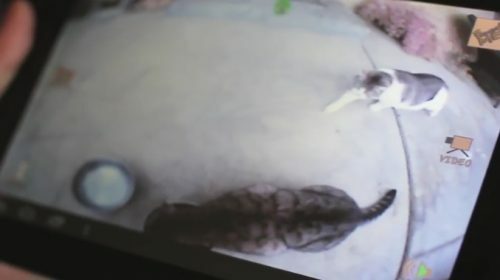 The feeder features a micro SD card slot to store a 1-min video. HOW’S THE WEBCAM OF THE BEST WI-FI MULTI-CAT FEEDER? Check much more great features on my Petpal full review. If you want to get the best multi-cat WiFi feeder and a unit made to last, you may want to go for this one, it’s highly recommended and rated 4.9 stars out of 5 from multi-cat owners.